Bariatric Folding Walker with Wheels. Two-button, adjustable height Bariatric Walker. The Bariatric Folding Walker includes wide 5" front wheels and 500 lbs. weight capacity. 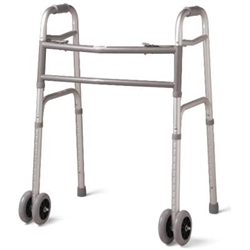 The wide, deep, aluminum frame has a large number of height adjustments and side braces for added stability and strength. Two-button folding walker is ideal for heavier users. Width Inside Hand Grips: 20.5"
Width Outside Base Legs: 26.5"
Height Adjustment: 33.5" - 43.25"
Patient Height: 5' 3" - 6' 2"